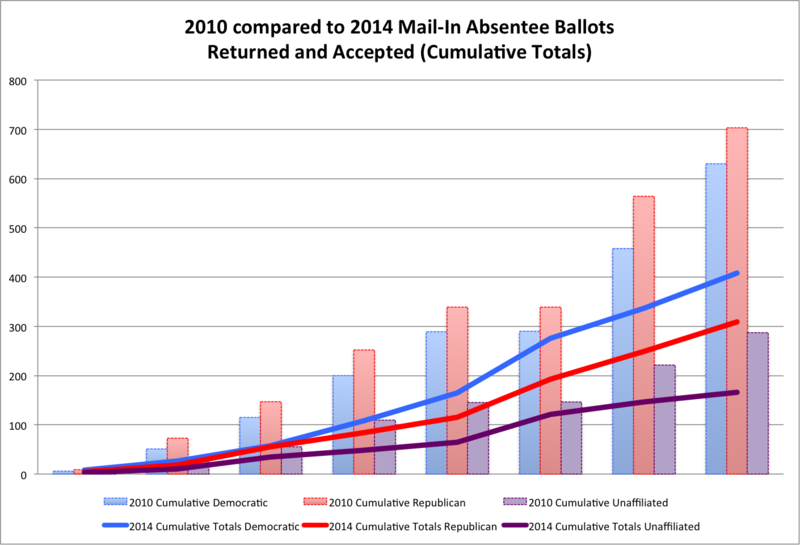 In looking at the 2010 mid-term election and the first couple of days of returned mail-in absentee ballots that were accepted in comparison to this year's returned & accepted mail-in absentee ballots, some notable trends stand out. In 2010, registered Republican voters began a pretty considerable lead in returning mail-in ballots, ultimately constituting 45% of the final mail-in accepted absentee ballots, with registered Democratic voters were 36% and registered unaffiliated voters were 19%. On the 10th day of returned ballots, Republicans were 43% of the ballots accepted so far in 2010. So far this year, with 10 days of returned and accepted ballots so far, registered Democrats are 46% of the returned accepted mail-in absentee ballots, while registered Republicans are 35%, with registered unaffiliated are 19%. If this trend continues, Democrats would be pleased with their turnout in a traditionally Republican-dominated use of early voting in North Carolina. More will be posted later today when I analyze the latest postings from the North Carolina State Board of Elections absentee data file.